As a doe kid Zealot was extremely successful - 8x1st, 3xGCH, 5xReserve, and 1xBIS. Zealot is very balanced and her mammary system is one of the strongest attributes especially the rear. She was 5x1st and 3x 2nd in 2010 and 9th at the ADGA National Show. In 2011 she began slowly, but blossomed after the National Show going 4xGCH and 2xReserve finishing her championship. In 2012 she was 2x BOB and 1xBIS. In 2013, Zealot has had very successful show season; going 2xGCH, 4xBOB, and 2xBIS. She is also a Current Excellent doe through ADGA's performance programs. Zealot was 5th place 4 Year Old and 2nd Place Udder at the 2013 ADGA National Show. Zealot came out hot in 2014! She was 6xBOB, 5xBDIS this year and looked AWESOME. She is following in the footsteps of her mother, Scandal. Furthermore, Zealot was 1st Place, 1st Place Udder at the National Show in 5/6 Year Old Class! After appraising 92 EEEE in 2015, Zealot contracted mastitis in one half of her udder and was not competitive throughout the rest of the show season. After freshening in 2016, Zealot returned to her normal self: appraising 92 EEEE again as well as being 2nd place, 2 udder Aged Doe at the National Show. Additionally, she was part of our 1st Place Dairy Herd & Best 3 Senior Does at the National Show. 2018 was again a great year for her as she won the 7 and older class at the ADGA National Show. Her twin two year old daughters also were 1st Produce of Dam, 2nd Mother-Daughter, and both finished their championships and appraised FS-90. We look forward to another daughter freshening next spring. Zealot will be bred to Kickapoo Valley Make It Jive. 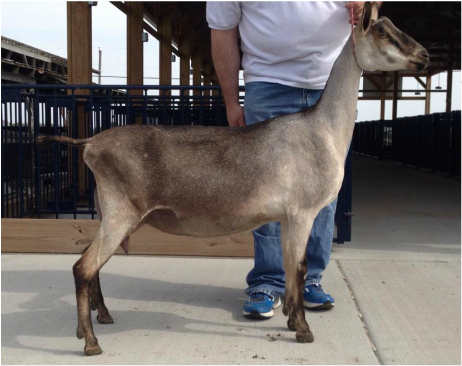 Delilah was the 14th place Senior Kid at the ADGA National Show and a full sister to our Colorama Sale Doe- Dionne. She freshened as a yearling with a terrific mammary system and was 6x1st in 2014. She freshened as a two year old and looks terrific. She is tall and dairy with a wonderful mammary system. She was 1st at the 2015 District IV Alpine Specialty. Her dry yearling daughter Kickapoo Valley Desi Electra was Junior Champion as well. As the show season progressed, Delilah continued to strut her stuff in the show ring. She finished her championship and went 3xGCH, 2xBOB, and 1xBDIS! We look forward to watching her mature, and think this goat is going to be like a fine wine. Delilah had a terrific year as a four year old. She was 5xBIS and placed 4th at the ADGA National Show. Delilah was dry in 2018 and we plan to breed her 2019 to Kickapoo Valley Make It Jive. One of our favorite doe kids from last year, Elegy has stood out right from the beginning. She is extremely tall and long, with a lot of width. She spent most of last year growing - and has continued. She is clearly a large yearling, but is also lovely in her tremendous length, smoothness of blending and a very wide mammary system. We are excited about her - she was 1st place yearling at the 2015 District IV Alpine Specialty, and continued on to top the class at most of the shows we attended, while being 2xRGCH. We had high hopes for this goat, and boy did she exceed our expectations as a 2 Year Old! At her first show, she was BDIS over 200 animals in Sedalia, MO! Then finished her championship and placed 1st Place, 1st Udder 2 Year Old at the ADGA National Show as well as was a member of the first place Senior Best 3 and First Place Dairy Herd! Elegy is not just a show goat, she milks too! She is projected to milk over 4,000 lb this as a 2 Year Old! What a disappointment - Elegy has been bred three times and each time is not able to carry her kids full gestation. Even though she has not cooperated the last two years, we have a plan to get Elegy bred this fall - she will be bred to Kickapoo Valley Make It Jive. Echo as a 2 Year Old in 2016. Echo went through some growthy stages as a kid. But once she freshened, it was clear that those stages made her worth waiting for. Echo is tall and long with a good amount of capacity to her mammary system for a yearling. We love her tremendously wide rear udder with nearly ideal teat size, shape, and placement. Echo matured a lot going into her 2nd lactation, and with that maturity came more size, depth, and more milk! She peaked this year at 14 lb. This doe reminds us of Music and we hope she will continue the trend of improving as time goes on! Echo continues to develop and was 4xGCH this season - unfortunately a skin problem did not allow her to travel with us to Madison, but we have retained a son from Rainmaker, and he will have some kids on the ground this spring. We love this goat for her general appearance. While she did not have an easy freshening this spring, she did place well throughout the year. We are planning to AI her ++*B Pleasant Grove Super Sage or naturally Windrush Farm Neo Momentum. Holy as a Milking Yearling at the 2017 Nationals. Holy had a great season as a kid. At the 2016 ADGA National Show she was 2nd Place Senior Kid and throughout the season was ​2xRGCH, 1xGCH, 1xBDIS. This season she freshened and did not disappoint. She was 6x1st, 2xGCH, 1x RGCH. 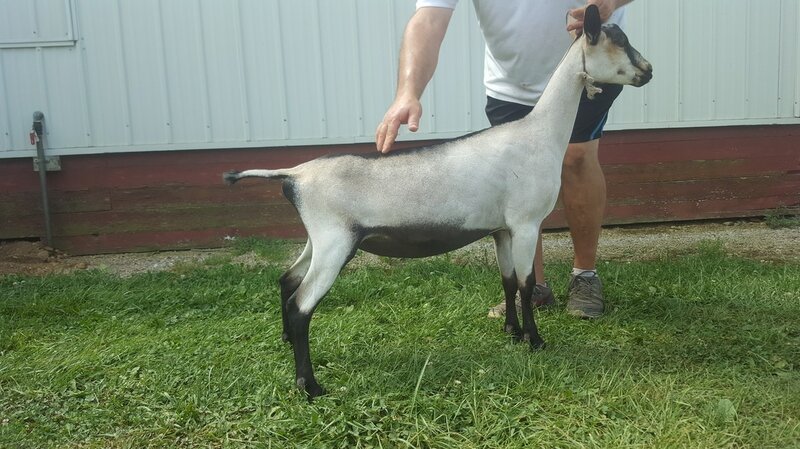 At the 2017 ADGA National Show she was 5th place yearling. Holy injured her leg in early spring - a typical Alpine, she has deemed herself as the primary go to goat in the lot to fight - as a result she often hurts herself. Despite this, she appraised well, has been 4xBOB, and was part of the 2nd place Senior Get of Sire at the National Show. Holy will be AI'd to *B Hoach's Golden Laser. Happy was 1st Place Intermediate Kid at the ADGA National Show Placing and 1xGCH. She freshened with a lovely udder and was 1xGCH this season needing one leg to finish her championship. She was 4th place yearling milker at the 2017 ADGA National Show. Happy is very reminiscent of her dam in body type as well as mammary. This season she was 8th place two year old and 2xGCH finishing her championship. She is being bred AI to Redwood Hills Stone Amnesty. Happen was the 4th Place Intermediate Kid at the 2016 ADGA National Show Placing as well as going BIS at the Illinois State Fair. As a yearling milker she was 3x1st and placed 2nd with 3rd udder at the 2017 ADGA National Show. Again she is similar to her dam with a lovely, capacious mammary. As a two year old she has been 7x1st - she was 7th at the National Show and a part of the 1st place Produce of dam and 2nd place Senior Get of Sire and Mother Daughter. She has peaked at nearly 14 lbs and has appraised 90 this year. She will be bred AI to Kickapoo Valley HLL Lord Wimsey.